Salesforce has been the established leader in cloud-based CRM for a number of years, making it an obvious contender for any company looking for a CRM solution–but it is not the only choice and it may not be the best choice, especially for an organization looking for a state of the earth CRM solution and have invested in Microsoft’s technology such as SharePoint, Outlook or Microsoft Dynamics ERP. Microsoft Dynamics CRM matches Salesforce in overall functionality and exceeds Salesforce in several critical areas. With technology considerations– When looking for a more natural fit in a Microsoft environment, more robust integration with Outlook and other Microsoft applications–Dynamics CRM becomes the preferred choice. 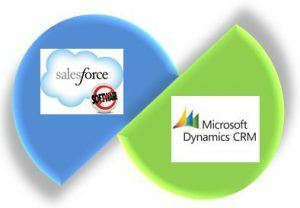 Why Consider Microsoft’s Dynamics CRM to Salesforce? Dynamics CRM is easily tailored to fit the needs and preferences of users at all levels of the organization. In a typical CRM environment, a user profile is set up by choosing the appropriate information to be displayed from a list of possibilities. In Dynamics CRM, unique forms can be developed to fit specific verticals. Users choose the type of customer, and the form automatically changes to enter information relevant only to that industry. This allows for collection of information that is meaningful to you and the customer with cleaner forms, as only necessary fields are displayed. The related Salesforce process is far more labor intensive. Dynamics CRM is easier to configure for reporting, dashboards and forms. Salesforce is only available in the cloud. Dynamics CRM can operate in the cloud as a software as a service (SaaS) application, may be hosted privately through a partner like Impax or deployed on-premise. It can be migrated between these platforms should business needs or objectives change. Microsoft has created industry solutions for nonprofits, project management, consumer products and trade promotion management applications, among others. These industry-specific variants help an organization get the most out of their new CRM system. For example, the tailored Dynamics CRM system is ready to help a nonprofit manage grants, donors, employees and volunteers, as well as customers or clients in one application. Other industries are provided with similar capabilities. All things considered, Dynamics CRM offers superior functionality, ease of use, deployment choice and lower cost. As a native Microsoft product, it fits better, simplifies support and benefits from tighter integration than a third-party product. If you can get all of this at a lower overall cost, does it make sense to go anywhere else for state-of-the-art CRM?